Winslow Leach (Albert Finley) is a song writer who has his work stolen by Swan (Paul Williams), a world famous producer. Winslow escapes from jail and is disfigured during a rampage in a record pressing factory. He then takes up residence in Swan’s new venue, The Paradise. He proceeds to terrorize the place. Eventually, he thinks he can force Swan into a deal. He wants his stolen masterpiece to be sung only by a woman named Phoenix (Jessica Harper). Swan, of course, has another idea. That idea is Beef (Garret Grahm). You're next, Andrew Lloyd Webber. 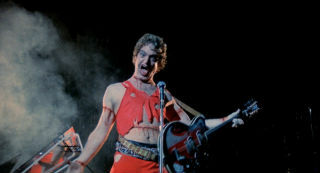 One of the biggest strengths of Phantom of the Paradise is its unique mix of goofball comedy and over the top tragedy. Winslow Leach is a pathetic schlep to point of absurdity, but William Finley’s performance gives the role emotional weight. Paul Williams takes a character who could have been one dimensional and imbues him with a note of sadness that brings him to life. Even Beef, the most over-the-top character in a film filled with them, has a few moments of pathos amongst his ridiculous antics. The whole film floats on a mix of 1970’s excess and Gothic horror. 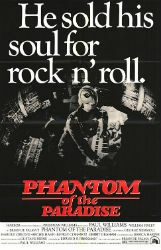 A rock opera wouldn’t be much of anything without music and Phantom delivers many memorable tunes. Most of them are musical variations on Winslow’s original song as it mutates further and further away from his original intent. Paul Williams wrote all of the music and he’s adept at both drawing a strong emotional core and engaging in the odd musical joke. He scored one piece of music for the film. It occurs during the bacchanal wedding/assassination at the climax. It’s a great instrumental piece that builds the tension for the tragedy to come. I think gets overlooked for the more traditional vocal numbers. No, I really do like Shock Treatment. I can understand why it took some time for Phantom of the Paradise to gain a following. The Rocky Horror Picture Show (1975) is much more up front about its influences. It also helps that it has an immediately likeable and attractive anti-hero in Frank N. Furter. Winslow is passionate and driven, but he’s disfigured and violent. Swan appears young, but in reality he’s a greedy withered shell. Phoenix is attractive and talented, but she lets the desire to sing professionally corrupt her. The whole film lives in world that is glam on the outside, but hideous on the inside. Rocky Horror postulates that under the veneer everyone exists as a beautiful freak. Phantom of the Paradise suggests something similar, but what exists underneath isn't so pretty. Phantom of the Paradise is quite possibly my favorite film of all time. I find its mixture of comedy and tragedy perfect. The story progresses from black humor to melodrama, before culminating in a chaotic celebration of death and tragedy. The music is enjoyable and can provide moments of insight into characters while still standing on its own. It’s a film I revisit every year, and one I look forward to revisiting in the future.